To fit your window box attach the supplied batten to the wall with the supplied screws and rawplugs and then slot the window box onto the batten. See image below. This smart Lincoln Windowbox is equally suitable for town or country windowledges. 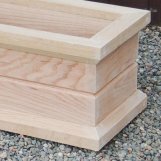 Lincoln window boxes are made from British Grown Oak, supplied with our easy to install, concealed wall hanger (together with all the fixings), plus holes in the base for good drainage. If you prefer we can supply it with a plain back to stand on the windowledge rather than hanging from the wall or fence. Just make a note in the 'special instructions' box on the way to checkout. The oak is either left natural or is finished with teak oil. Teak oil brings out the grain and deepens the colour of the oak. Delivery approximately 30 days Postage and Packaging is included for the Uk Mainland. We also offer a bespoke service, so if you would like this or any of our own wooden products made to your own preferred measurements please contact us and we will be pleased to help. If you live in the Channel Islands, Highlands and Islands or Ireland please ring 01952 541170 or email sales@thelichfieldplantercompany.co.uk for a quote for delivery. Re-create the casual crush of an old fashioned border in a window box with a carefully chosen combination of perennials. Mix colours, shapes and textures for a more casual effect. To help you select the best plants for your Window Box. We have put together a list with pictures and tips for cultivation indexed under the seasons of the year. roses, herbaceous plants and shrubs offering a continual visual treat. And it was exciting: they would throw down a handful of seeds and see what came up. The effect was dense, not sparse. Nor were they afraid to use different colours: a cottage garden would mix red roses, blue delphiniums. yellow, rudbeckias, purple foxgloves and sweet peas in all shades, combining pastels with strong colours all at once. It is the opposite of the modern fashion for using only one or two plants in a single hue, and it still has a strong appeal. To achieve the effect in a window box you need to choose perennial plants rather than popular bedding plants, to give the succession of effects and the critical mixture of textures. Web Template created by The Robertson Martin Company.